Collapsed Sewer Repair and Replacement? Collapsed sewer pipes in nj can be a serious nightmare for New Jersey homeowners. 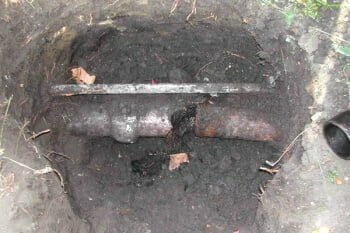 This serious emergency happens when a section of your sewer main line gives out completely, usually as a result of years of gradual damage, corrosion, and general decay. A collapsed (broken) sewer or drain pipe is an acute emergency, requiring immediate sewer repair services to prevent further damage to your home, yard, and household plumbing systems. If you have a collapsed sewer line, you’ll probably experience failed drainage in your plumbing, bizarre behavior from your plumbing fixture, and sewer backflow of dirty wastewater into your drains and toilets. If you notice these signs, call us immediately at A1 Sewer & Drain for 24-hour emergency sewer repair services in NJ . A sewer pipe repair company in nj should be called right away if you see any signs of a sewer collapse. Although it happens after years of strenuous wear and tear, usually in older pipes, the actual sewer pipe collapse happens suddenly, seemingly out of nowhere. The results can be disastrous, and from a homeowner’s perspective, it’s unpredictable. Your drains are running slow, or are backing up constantly. This generally involves all or most of your household drains and toilets, not just one of them. This is a sign that the problem is in the sewers, not the drain pipes. Backed-up basement drains. Basement drains, common as a flood prevention measure in New Jersey homes, are particularly susceptible to sewer backflow in the wake of a sewer pipe collapse. Gurgling noises in your drains. This is never a good sign, and paired with slow drainage, it’s often a sign that you need sewer pipe repair as soon as possible. Your toilet bowl levels keep rising and falling, seemingly at random. You can smell sewage in your home. This is because wastewater is backing up into your plumbing pipes, bringing foul odors with it. Raw sewage on the ground outside. This is a pretty obvious sign of a collapsed sewer pipe. The wastewater can flow up, soaking the surrounding soil and creating a terrible smell. Sink holes or soggy areas suddenly appear on your property. This results from the wastewater leakage that’s soaking your soil. 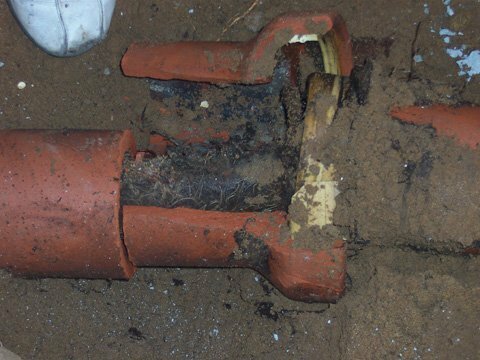 These symptoms of a broken sewer pipe mean that you need to act fast, in order to prevent further damage or hazardous sewer backflow into your home. If you notice these problems, call a sewer repair company immediately for same-day service. A sewer pipe collapse in nj is one of the most serious problems that can happen down in your sewer main line, and only professional sewer pipe repair can fix the problem. Although a collapsed sewer pipe seems to occur at random without prior warning, this unfortunate phenomenon is actually largely preventable. As a homeowner, there are several things you can do to help prevent your sewer line from suddenly breaking and collapsing. Prevent tree root incursion. 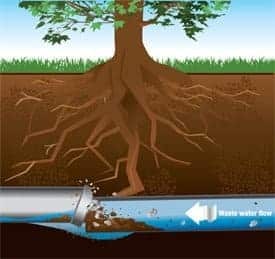 One of the most common causes of structural issues with sewer pipes is the invasion of root systems from nearby trees. Many New Jersey homeowners use chemical or physical barriers within the soil to discourage root systems from getting too close to the sewer line. Replace aging pipes. The type of sewer pipe that’s most prone to collapsing is called “Orangeberg pipe.” Although it’s less common than it once was, Orangeberg pipe was used during WWII as a result of metal shortages. Made from compressed tar paper, it doesn’t hold up well after decades of use, and will often collapse. If you own a historic home that was built in the 1940s, you may want to order a professional sewer inspection to make sure you don’t have Orangerberg pipe. If so, you can have the sewer pipes replaced with iron, copper, and other more durable modern materials. Sewer pipe repair, inspection, and cleaning. Maintaining your sewer line, and getting sewer repair service for more minor problems, can go a long way toward preventing an ultimate sewer line collapse. If you already suspect you might have sewer problems, it’s best to call a sewer pipe repair company as soon as possible. Timely sewer cleaning and sewer repairs can prevent a collapsed sewer pipe from happening. Emergency sewer repair in new jersey is available if you suddenly have a collapsed sewer pipe, don’t wait around for fast, reliable sewer repair service, you need it taken care of immediately. When you need same-day sewer pipe repair in New Jersey, call us 24 hours a day at A1 Sewer & Drain for emergency sewer services, at 201-645-0888.